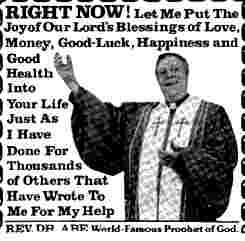 The bottom of this ad says it's from "REV. DR. ABE, World-Famous Prophet of God." If it's "Good-Luck," why isn't it "Good-Health"? And if you capitalize "The" and "For" and "To" then why not capitalize "of"? Anyway, apparently the world-famous Reverend Dr. Abe got his doctorate without ever learning that it should be "others WHO have wrote me," not "others THAT have wrote me." See here for more info.